In June 2002, Robert Hong, BA (Hons., MUN), MA (History, MUN), approached the Newfoundland and Labrador Heritage Web Site with an offer to provide us with a digitized version of the Amulree Commission Report. Earlier in the year he had entered the entire document into a word processor with the intention of making it available to the public in an electronic format. Once we were satisfied with the accuracy of the electronic version, we were delighted and thankful to accept Robert Hong's offer. At the bottom of this page you will find a link to a PDF verion of Hong's transcription. In most cases, the report is the text and layout as we received it. There is one notable exception. A series of 65 black and white photographs are incorporated into the PDF version. These photographs were part of the final report, but were presented in their own album. 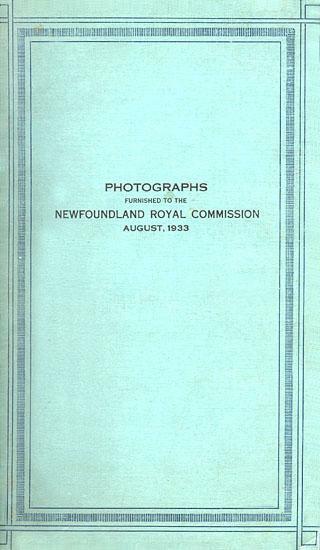 Album cover of photographs furnished to the Newfoundland Royal Commission, August 1933. Courtesy of Archives and Special Collections (Coll. 207), Queen Elizabeth II Library, Memorial University of Newfoundland, St. John's, NL. They have been embedded into appropriate locations in the PDF file to provide a visual representation, whenever possible, of places mentioned in the 1933 report. The images mainly depict the architecture and landscape of Newfoundland outport communities, several of which have since been resettled. There are a number of images of northern Labrador showing the rugged terrain along the coast. None of the photographers are identified, but 36 of the images are known to have been taken by the noted Newfoundland photographer Robert Holloway (1850-1904) or by Holloway's studio. Most of these images likely date from the end of the 19th and beginning of the 20th centuries. The remainder were probably taken in the year 1933. They are aerial photographs, and according to the CNS Archives where the images are held, they are possibly the work of two different photographers. PDF version of Lord Amulree's Newfoundland Royal Commission 1933 Report. For other related articles view the Collapse of Responsible Government section of the Government and Politics Table of Contents.